Discussion in 'iPhone and iPad Games' started by sivad, Sep 17, 2015. 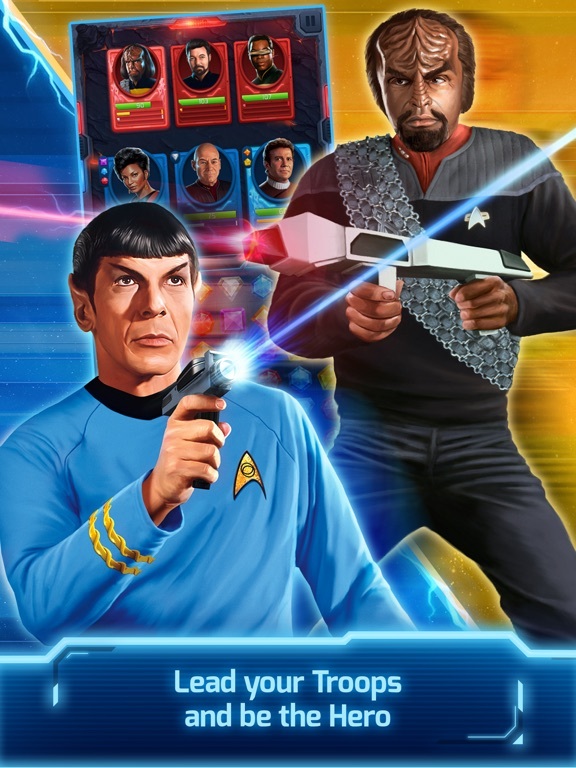 The beloved Star Trek ™ franchise comes to life in the official RPG puzzle quest! 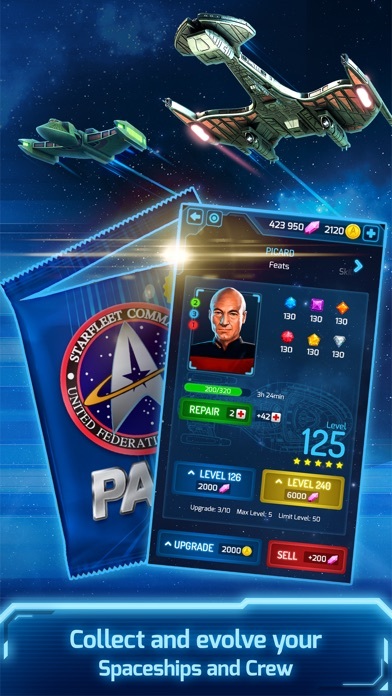 Join the federation in this exciting game that combines your favorite Star Trek ™ characters from The Original Series and The Next Generation, together with starship battles, one on one combat, versus tournaments, and deep RPG leveling. Become a part of this global phenomenon, for fans both old and new! 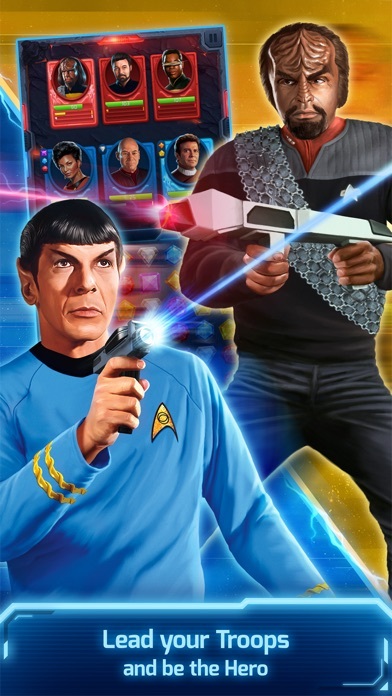 **RECRUIT AND TRAIN A SKILLED CREW** With deep RPG, recruit your favorite characters from TOS and TNG to create the ultimate crew! Will you need Jean-Luc Picard’s leadership, or Worf’s power? Take advantage of Commander Spock’s logic and Leonard McCoy’s medical background. Assemble your own epic team and evolve them to defeat your opponents and protect the universe. 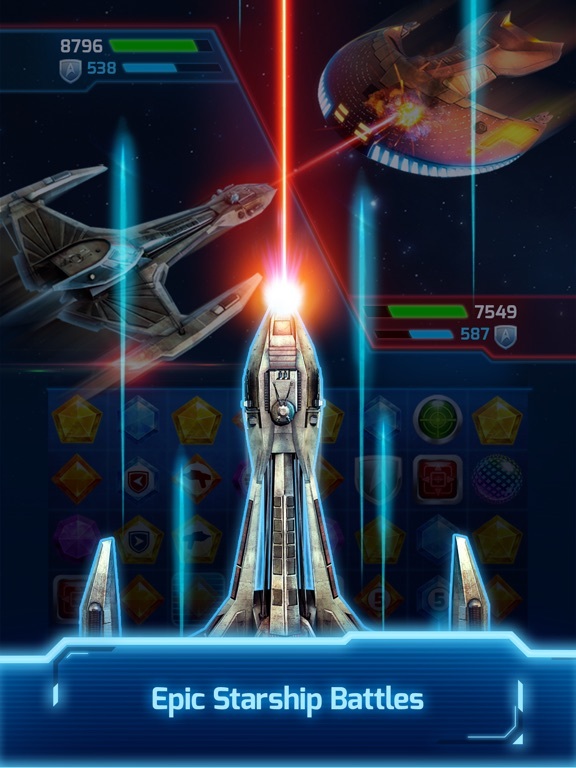 **MATCH TO DEFEND THE FEDERATION** Match gems across three varied puzzle game modes to defeat your enemies in starship battles, one on one combat, and diplomatic encounters. Strategize and use the special abilities of your crew and fleet to bring opponents to their knees. Match and battle against different races and their ships, like the Cardassians, Klingons, and Romulans! Collect cards to unlock new characters and abilities. The Star Trek ™ roster is constantly growing with new characters and tiers each week! **PLAY WITH FRIENDS IN SPECIAL VERSUS EVENTS** Beat your friends and get the top rank in special tournaments and weekly versus events! Unlock new characters and ships with extra level ups and match gems in exclusive missions to win extra prizes. Explore unseen parts of the galaxy as you journey across space, the final frontier! **BECOME A PART OF THE STAR TREK UNIVERSE** Are you a true fan of the Star Trek ™ series and films? Have you got what it takes to enter this galactic world, join the Federation, and save the Universe from destruction? Remember your favorite moments and discover never before seen stories! Starfleet has chosen you, so take command of your starship and join this official and totally authentic Star Trek ™ experience! 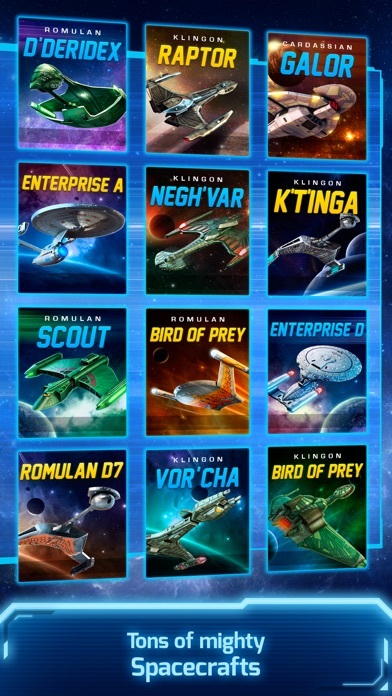 GAME FEATURES: * Play with your favorite characters, ships, and races from TOS and TNG! * Win special packs and evolve your crew and starships and gain new abilities! * Experience two different campaigns with unseen adventures from both series! * Three intense game modes! Starship battles, one on one combat, and diplomatic encounters! * Weekly events and tournaments! Beat your friends and get exclusive prizes! 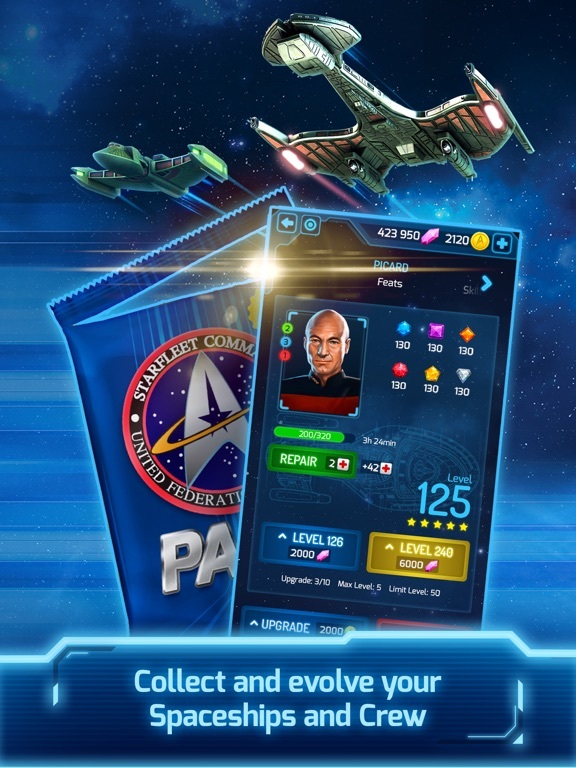 Star Trek ™ is back, and you can become captain of your own ship in this free RPG match 3 puzzle game! Get it now! 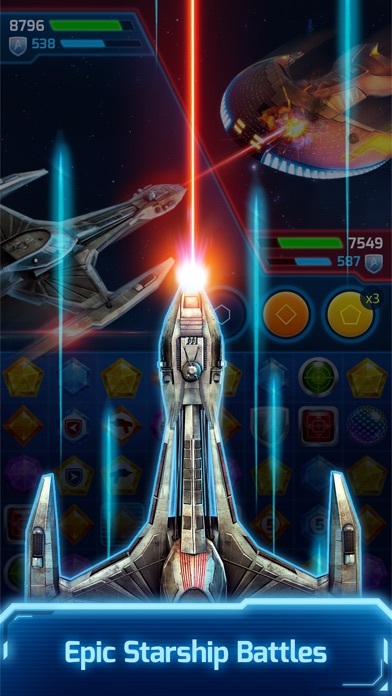 “This race through space will keep you at attention as if you were on the bridge Starship Enterprise itself!” – App Advice “The game on every Trekkie’s ‘Must Try’ list” – Tech.co “Play it and feel the shivers again as you boldly go to places where no man has gone before!” – PocketFull of Apps “An adventure unlike any casual game the Enterprise has encountered before!” - Video Game News Source PLEASE NOTE: Star Trek ™: Wrath of Gems is a game that's completely free to play. However, you will have the option to buy some in-game items for real money. If you'd prefer to not use this feature, please disable in-app purchases in your mobile device's settings. Live Long and Prosper! My impression so far (like, 5 levels in) is that I like this better than Marvel Puzzle Quest, though it is very similar. VERY SIMILAR. Except that it's Star Trek. Looks pretty and runs well on iOS 9. I'm surprised that no one is talking about his game more. I like it much better than the others if its kind (but not a fan of the "always online" part) and strangely addicted to it. Unfortunately all of the IAP is consumable. So I cannot make any purchases. I actually do like the core game. I think it's the first match 3 game where the AI actually uses the same board as you to make their moves. I stumbled on to this game through a Fantasy Football site and was shocked that I hadn't heard about it before. I'm really liking it so far. Basically the Puzzle Quest formula, but with more to do. You can fight space battles with your ship, battle against bad guys (picking your team out of your crew) and even against your own crew when you need to convince them of something. 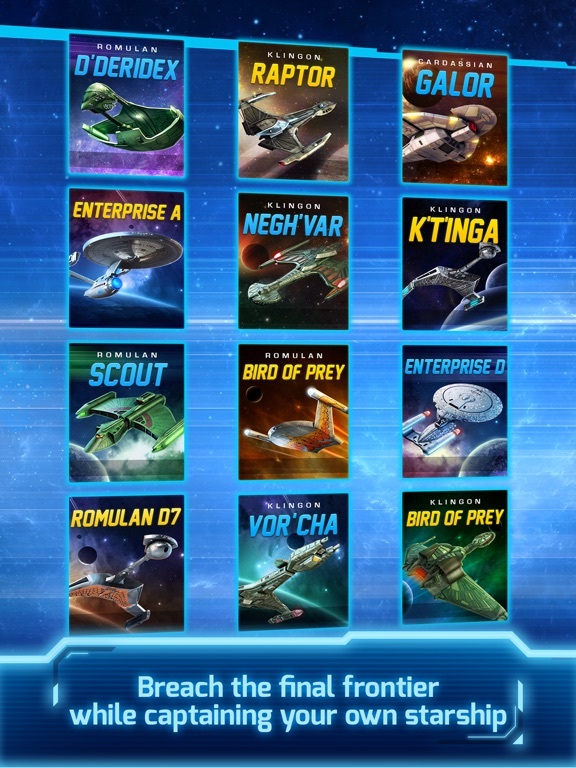 The variety is a nice change of pace, but I would have been happy enough with just the ship battles. The rest is icing. There is a nice story element going on and you can run stories from both TOS and TNG crews. Winning battles gives you more crystals, coins, crew and ships. One other gripe is that the story blocks move by too quickly. Often you can't finish reading a box before it's gone. Devs need to give an option to slow it down. I can imagine those who have English as a second language being very frustrated. But overall I am a Trek and PQ fan so this game is perfect for me. Graphics are nice and I'm enjoying the game and story. I haven't hit anything yet that has made me consider an IAP, so that's nice so far. Nice game. After the first episode, I could see how this game was really going to require IAP. No good way to collect coins, which you really need to get characters. I love Star Trek. I love match 3 games. But I just couldn't justify this one. Maybe in the future it will be balanced better, but I felt like I was hitting a huge paywall after some initial enjoyable gameplay. Genera Mobile brings another generic match 3 game. It was mentioned that "there was no way to earn coins" other than IAP. That's not quite right. It's in the grind I mentioned above. You play the same mission a few times and you get coins. I've been able to do plenty with coins without IAP. But there is the grind. On a 4S (at least on mine) it runs choppy. It begins well, but all the ships animations/lasers, etc. end up in hiccups and even freezes. iOS 7.1.2 JB, btw. No good way. After you replay the missions 3 to 4 times, you don't earn anything but dilithium from replaying. I mean, it earns some coins, but I ran out pretty fast. The cost of additional slots for ships and crew is way higher than what you can earn, at least early on. Not sure if it makes a difference, but I was playing TNG. Grind is expected in this type of game. I guess I could have just grinded... ground... grind??? dilithium really slowly to build up my characters and progress. Maybe I'll reinstall and give it another go. I did like having something Star Trek on my phone. Its a fun game but hit the coin paywall a little too fast. Bummer because i was really enjoying it up until now. This game doesnt make any sense. I figured that i would play the weekly challenge and was doing great with my level 12 ship destroying level 1 enemies. One after another after another. Level 1, level 1, level 1, level 2, level 3, level 5, level 16. Huh? Why 16? Thats not right. I had a bunch of dilithum so I figured id upgrade my ship but i need 300 coins and only have 75. Grrrr. Well, tower defense used to be the most played out, unoriginal, genre on the App Store. But match-3 games have now taken over that title. 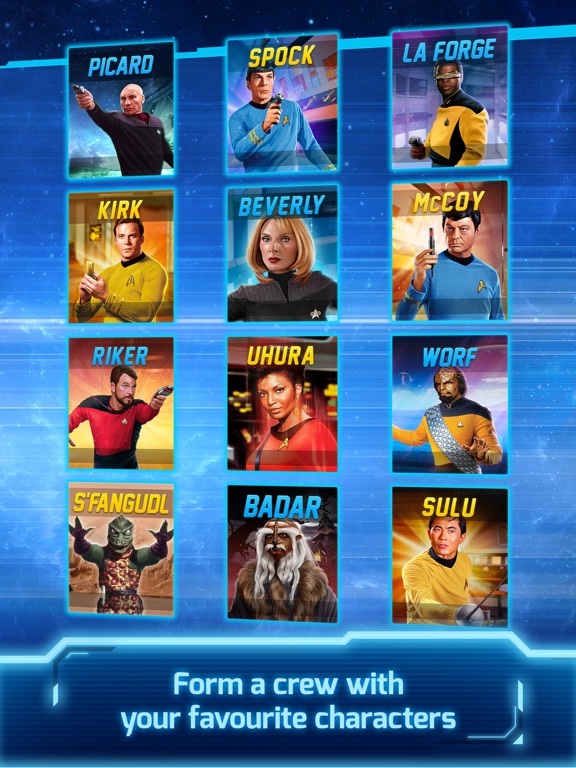 Seriously, can we get a semi-real Star Trek game on IOS? Besides FTL that is. I'm getting the same freezing problem with my iPhone 4s. Can't replay missions because the screen freezes. I'm really liking this game. It's a much more accessible version of Marvel Puzzle Quest with a great IP. You should only be using gold to buy slots just like on MPQ. I mad a mistake and bought evolutions at first with gold, so I reinstalled. I'm excited to see how this develops. Does anyone know how to assign crew members or items to your ship? This is a "tip" given in one of the loading screens, but I've yet to find a way to do so. I earned a laser item from one of the episode quests but cannot see it anywhere. I'm only a few missions into the second episode on TOS, so maybe it's something you unlock later, but it seems odd that you could earn items before you can actually use them. I think your ship has to be at level 10 before you can equip stuff. When you are on the stardock screen, tap your ship, then swipe. Swipe one is the gem powers, swipe two is the crew, and swipe three is the weapons. In at a point in chapter 2 where im grossly overpowered and gave no way of advancing without buying coins. I really like this game but not enough to need the $99 coin pack just to beat it. This is true. I was playing through Second part Mission 3 (Ambush) of the TOS storyline and I ran out of coin and dilithium. I am no longer at level with combatants and getting my you-know-what handed to me every time. Rewards are just squirts of dilithium. I played versus for a while but I noted that the enemy was winning through unseen match 3s that were dropping from the top, so winning coin was not just a grind but a chore. In other words, hello paywall. This is no puzzle quest and there is zero incentive for me to continue, the IAP amounts are too outrageous. 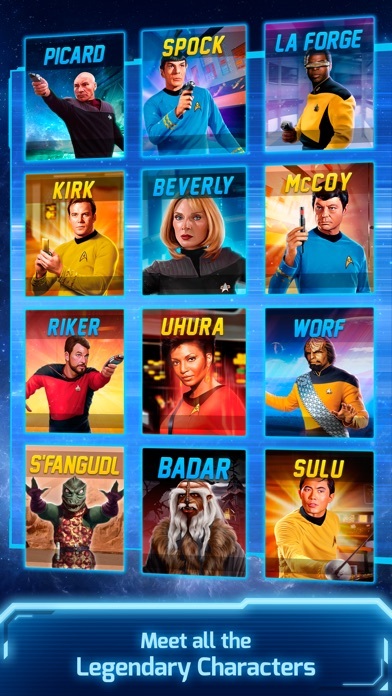 I hate to delete, though, as I like having a Star Trek game installed on my phone, being a big fan and all.